This is the start of a new year and we hope that it is a good one for you. We have had quite a few new members join the Golf Club and we would like to welcome them: Ross Bennett, Gary Hodges, Sue Mallery, Gary and Suzanne Popelka and John German. 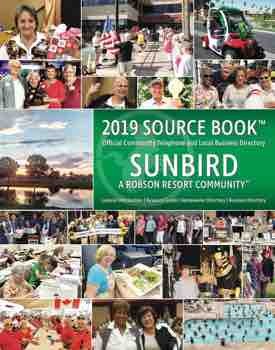 A special thank you to the SunBird teams, sponsors and contributors of the CRAB Tournament and SunBird Open Tournament. These two tournaments helped generate $23,546 for the golf course (CRAB $13,565 and SunBird Open $9,981). SunBird Golf Club appreciates all the hard work and effort both tournament committees put in to accomplishing these feats. The money generated helps offset expenses that the course incurs and helps purchase new equipment like the Rough Mower that broke down during over seeding. Once again a huge thank you to everyone involved. PS: The Americans won again. Our first tournament of the New Year is the Founder’s Scramble formally known as Members Tournament on January 28. Another change to this year will be that the Horizon Room will co-sponsor the tournament and prepare the tournament meal and the pre-tournament party on Friday, January 27. This is a four person ABCD draw Scramble and teams will be paired according to handicaps as determined by the Pro Shop. Sign-up slips are available in the Pro Shop and the cost will be $40 per person. You must be a SunBird Golf Course certificate holder to be eligible to play in this Tournament. The Pro Shop hours are from 8:00 a.m.-5:00 p.m. daily and call in times will start at 8:00 a.m. You may book tee times via the internet at our website, www.Sunbirdgolf.com, or www.golf18network.com, call in to the Pro Shop or stop by for a visit and book one in person. The current times available are Monday-Saturday 9:00 a.m. shotgun start with tee times starting at 1:00 p.m. Sunday there are tee times available starting at 8:00 a.m. all day long. We do have our late rate for nine holes after 3:00 p.m. for $12 walking/personal cart or $15 including cart rental. Tuesday’s Nine and Dine special for $20 and Friday’s Food and Fun special for $18 are available after 2:00 p.m. daily. Once again, we wish everyone a Happy New Year and hope to see you out playing.